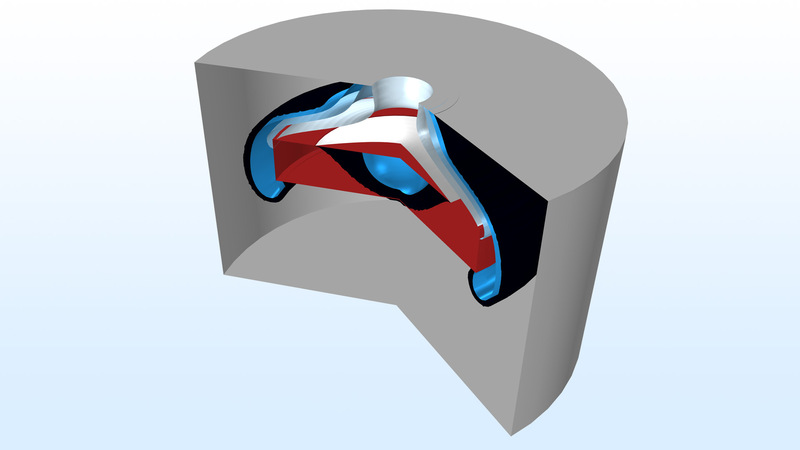 For users of the CFD Module, COMSOL Multiphysics® version 5.4 includes large eddy simulation, fluid-structure interaction for multiphase flow, and phase transport in free and porous media. Read about these and more CFD Module updates below. 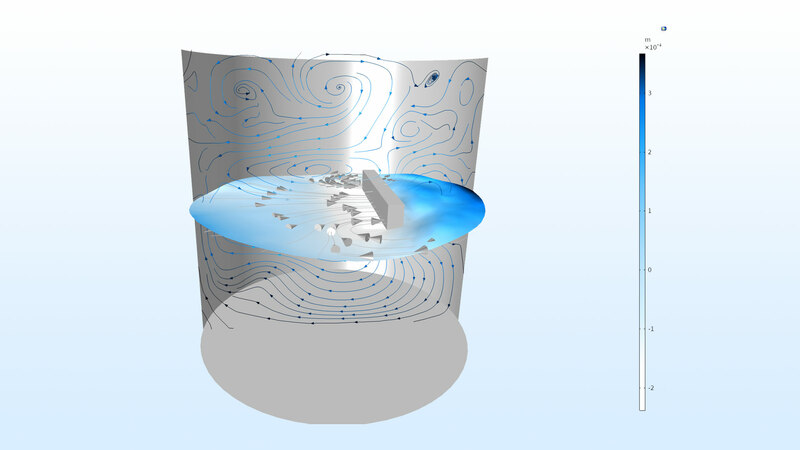 Large eddy simulation (LES) for single-phase flow is now available, offering an alternative for turbulent flow simulations, as compared to the Reynolds-averaged Navier-Stokes (RANS) approach. In LES, the larger three-dimensional unsteady eddies are resolved by the mesh, whereas the effects of smaller eddies at the element scale or below are approximated. This requires that the simulations are 3D and time dependent. Rapidly evolving cluster computing technology is making LES feasible not only for academic modeling, but also for industrially relevant applications. There are currently three LES model interfaces, which are all based on variational multiscale methods — a variational approach to filtering unresolved scales, suitable for finite element methods. Surface plots of the velocity magnitude and isosurface plots of the streamwise velocity for turbulent channel flow at Ret = 395. The simulation was performed using the LES RBVM (Residual Based Variational Multiscale) interface. The new interfaces Phase Transport and Phase Transport in Porous Media can be used in combination with single-phase and multiphase flow interfaces to simulate multiphase flow in free and porous media with an arbitrary number of phases. Additionally, Multiphase Flow in Porous Media is a predefined multiphysics coupling between the Darcy's Law interface and the Phase Transport in Porous Media interface. 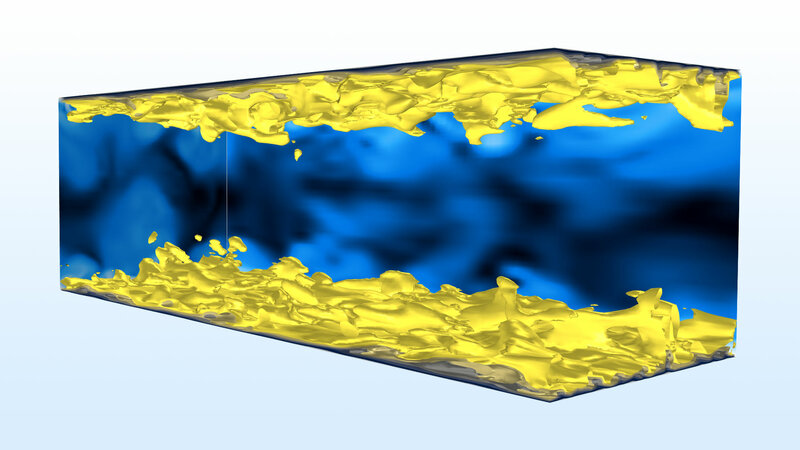 It can be used to simulate multiphase flow with an arbitrary number of phases in a porous medium, and allows the user to specify porous media properties such as relative permeabilities and capillary pressures between phases. 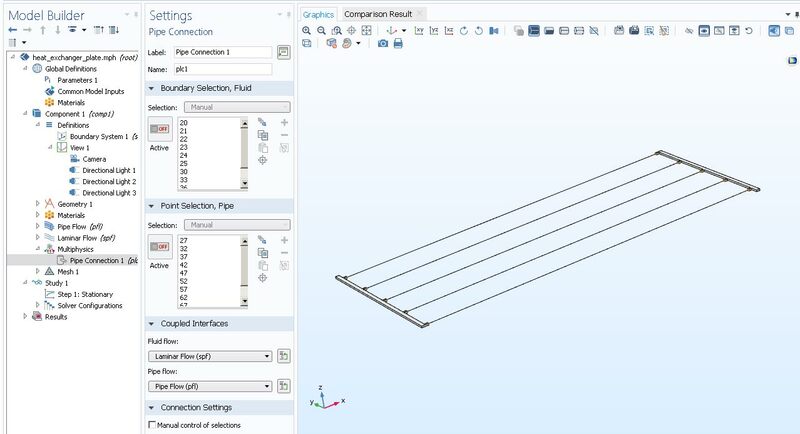 You can see this functionality demonstrated in the Two-Phase Flow over a Low Permeable Lens model. Turbulent multiphase flow through a circular orifice, placed in a pipe, simulated using the Mixture Model, k-epsilon interface combined with the Phase Transport interface. The populations in the five predefined droplet-size groups are redistributed due to turbulent shear-induced breakup. Two-phase flow in a porous medium that contains a low permeable lens (red). Contour surfaces are shown for the heavier phase as it infiltrates the porous medium from above. The low permeable lens is infiltrated only when a critical saturation at the outside of the lens is reached. Two-phase flow in a porous medium that contains a low permeable lens (red). Contour surfaces are shown for the heavier phase as it infiltrates the porous medium from above. The low permeable lens is infiltrated only when a critical saturation at the outside of the lens is reached. 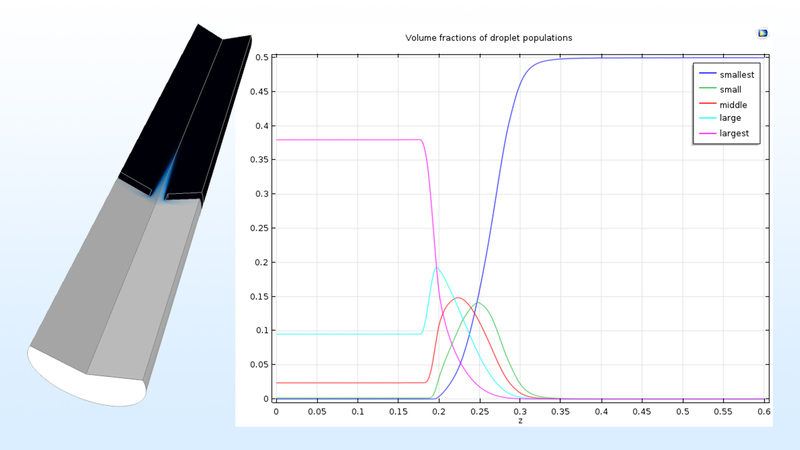 The Fully developed flow option can now be applied to both Inlet and Outlet boundary conditions for both laminar and turbulent flow. This option adds equations for fully developed flow in pipes of arbitrary cross section, corresponding to that of the inlet or outlet boundary, and couples them to the equations in the computational domain. At the inlet or outlet, you can specify the average velocity, flow rate, or average pressure. Additionally, turbulence variables are part of the solution. 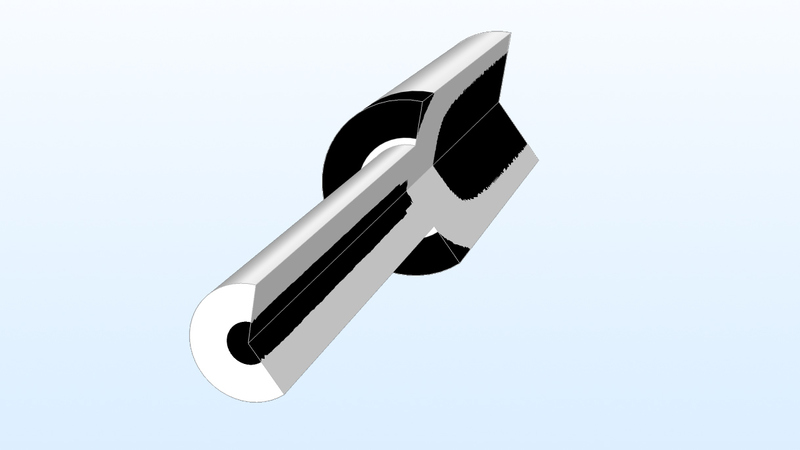 You can see this functionality demonstrated in the Flow Through a Pipe Elbow model. 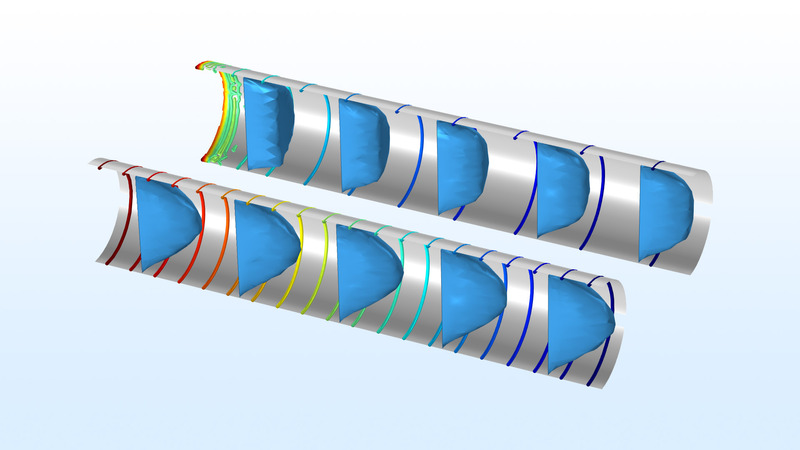 Velocity profiles (blue) and pressure contours for flow in a semicircular pipe simulated with and without the Fully developed flow option. Without, there is a large pressure drop at the entrance due to the incompatibility between a uniform velocity profile and the no-slip condition at the pipe wall. Anyone who has tried to pour ketchup out of a bottle has encountered a yield-stress fluid. 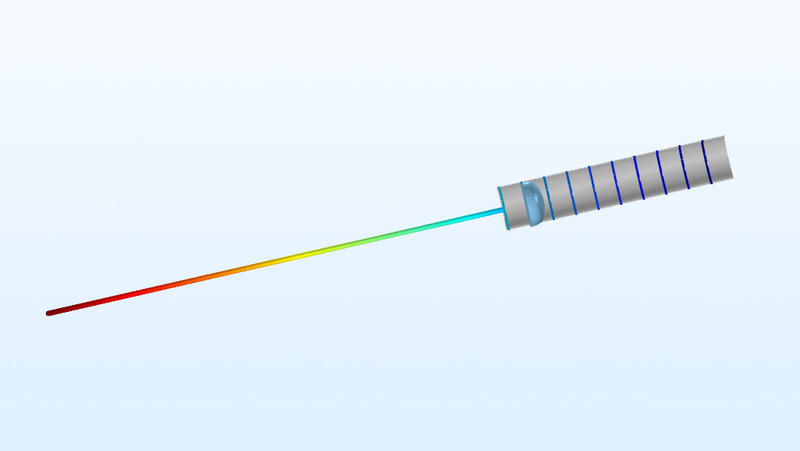 Three yield-stress viscosity models have been added to the non-Newtonian viscosity models. For the Bingham-Papanastasiou and Casson-Papanastasiou models, the viscosity approaches a constant value for large strain rates. The Herschel-Bulkley-Papanastasiou model behaves as a power-law fluid for large values of the strain rate. Yield surface for a Herschley-Bulkley-Papanastasiou fluid. The dark area shows where the stress is lower than the yield stress. This could either indicate that the flow is stagnant or that there is plug flow in these regions. The Two-Phase Flow, Level Set and Two-Phase Flow, Phase-Field interfaces now support the full range of turbulence models. 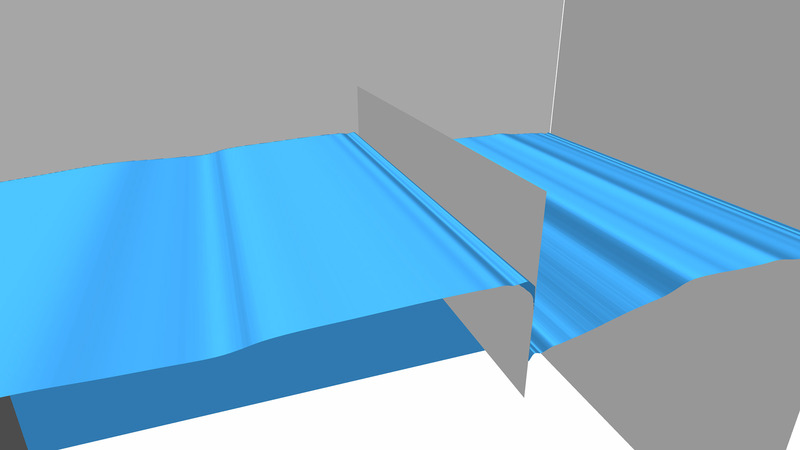 Level set simulation of a cylindrical tank with an obstacle moving back and forth at the liquid surface. Level set simulation of a cylindrical tank with an obstacle moving back and forth at the liquid surface. The Two-Phase Flow, Level Set and Two-Phase Flow, Phase-Field interfaces have a new Interior Wetted Wall feature that is applicable on interior boundaries. This complements the already existing Wetted Wall feature that is only available for exterior boundaries. These features allow you to specify a contact angle on an interior moving or stationary wall. For the Two-Phase Flow, Level Set interface, the Interior Wetted Wall feature is a multiphysics coupling feature, and for the Two-Phase Flow, Phase Field interface, it is a feature in the Phase Field interface.